At this year’s Developers’ Conference, the South Koreans not only looked at their software plans, but also showed their first foldable device, which unfolds into a 7.3-inch display. In the heart of the tech world, San Francisco, more than 5,000 developers meet for two days to talk about Artificial Intelligence, Virtual Reality and Gaming – as well as flexible displays. 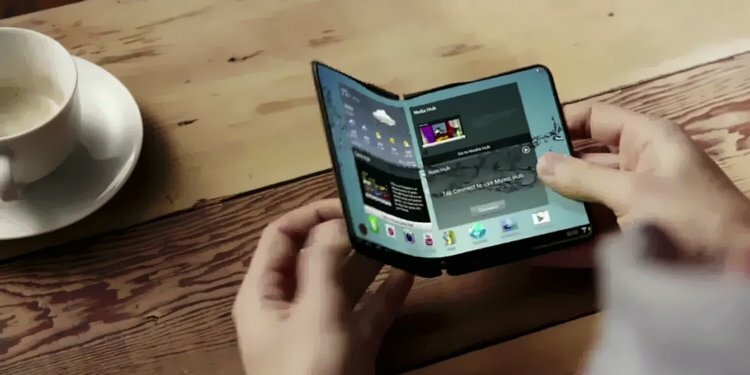 Samsung met expectations and showed its “Infinity Flexible Display”. The 2-in-1 device is smartphone and tablet at the same time. Edge, which was rounded on both sides and since then is standard in the Galaxy devices. These devices were always in a rigid frame. Samsung has apparently solved a long-standing problem with the “Infinity Flexible Display”. The automatically generated break point. The device should survive “hundreds of thousands of times without kinking and breakage”. So that the display does not split into two parts, competitors have installed hinges; such as ZTE with the Axon M. A similar system is also pursuing Microsoft with a recently filed patent. Two screens are connected by a metal strut. To protect the hardware components and the display, we alternatively worked on a glass. The flexible plastic version survives the bending processes and is particularly resistant. In unfolded mode, the device has a size of 7.3 inches. “But you would never let me tell you more about the device today,” says Justin Denison, diminishing expectations of trying the device in San Franciso. But it should be presented at the next event. Mass production should start “in the next few months”. Thus, it could already be presented at the mandatory press conference in Barcelona in the spring. So far, only the US company Royole has had a product ready for production. The FlexPai is also smartphone and tablet. Rolled it comes to a size of 7.8 inches. According to the official press release of the company, the display should be able to be kinked up to 200,000 times. According to studies, we look at our smartphone 88 times a day, so the Royole would give up after 2272 days. According to first reports, Royoles Software Water OS still has massive weaknesses. “The Verge” writes that rather the hardware is in the foreground. But the keynote was not just about a “new mobile era”. Not so long ago, Artificial Intelligence, Internet of Things and 5G were a vision, they are within reach today, DJ Ko explains at the beginning of the conference’s inaugural event. “By 2020, all Samsung devices will be equipped with Artificial Intelligence,” promises Eui-Suk Chung. The head of the software and AI division said in the keynote that Samsung’s smart assistant Bixby is an elementary part of this strategy. The assistant will finally be available in December in German and in four other languages. After a long period of development, the Koreans open up. Developers can also develop applications for Bixby in the future. The assistance market is still relatively young, emphasizes Dag Kittlaus. “When Google came, there were 14 search engines,” he explains, wiping out Google’s concern over possibilities that Samsung will be launching its own assistant too. Amazon has a market share of nearly 43.6 percent according to statistics from Strategy Analytics. Samsung does not even appear in the listing. This is to change the Bixy Developer Studio. Also Galaxy Home, which announced in August with the Note 9 smart speaker will be part of the Developers Studio. When will the Harman Technology-equipped echo competitor will hit the market is still unclear. Samsung has screwed on the user interface. It was not only visually adapted to the design of the devices with rounded corners. At first glance, the surface is also tidier. The paths were shortened. The lock screen becomes the central hub. “The operation was geared to one-handed operation,” explains Jee Won Lee. As the devices got bigger, you needed a “very long thumb”. Because of this, controls have been moved down. The night mode has now been integrated into all standard apps. The open beta will be available later this year. The Galaxy S9, S9+ and Note 9 should receive the new user interface by the beginning of 2019 via update.